Unique and amazing collectibles. Our Mister was an artist and has left behind most of his collection. Art of all kinds. His and other artist. Nudes were his thing. Incredible 1960's & 1970's pieces. He has been painting since 1930's. Glass, china & pottery. Books and paper goods. Newspapers, books, postcards, advertising pieces. 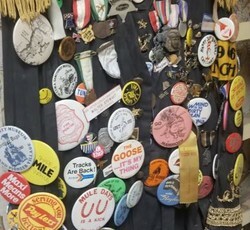 Decades of Bakersfield Memorabilia. Tools, garage & retro items. Garden benches and lots of statuary. Bolo ties, furnture & vintage clothing. Kitchen items, appliances, refrigerator too.